The church of St Mary the Virgin in Edlesborough is part of the parish of Eaton Bray and although the church is actually in Buckinghamshire it is included as it belongs to a Bedfordshire parish. 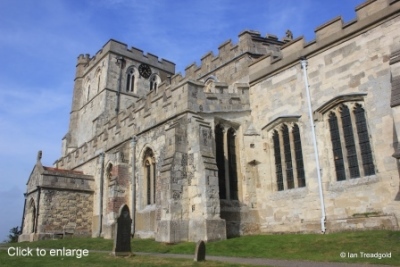 The church is situated on a mound to the south-east of the village beyond the A4146 Leighton Road. 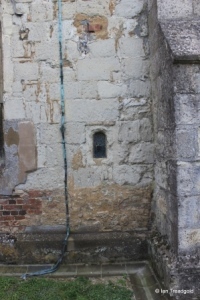 Parking is available on the streets to the north of the main road. 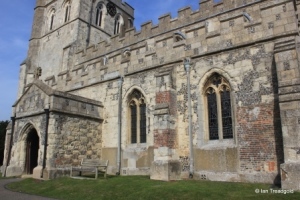 The church consists of a nave, chancel, two aisles and porches, a north chapel and west tower. 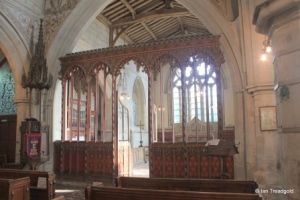 The chancel is around 39 feet long and the nave adds a further 56 feet. 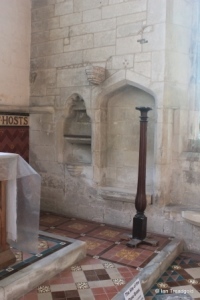 Both are around 21 feet wide. 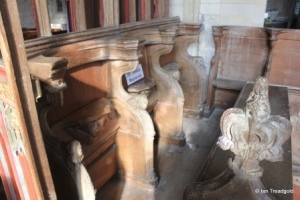 The two aisles each add around 10 feet to the width. 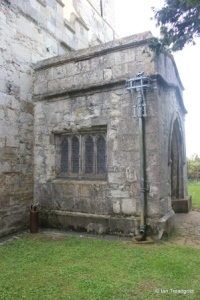 The north transept, occupied now used as a vestry is around 15 feet square and the tower adds about 17 feet by 15 and 60 feet in height. 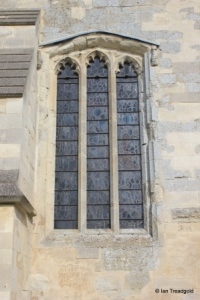 The south aisle has an east window of two cinquefoiled lights under a square head. 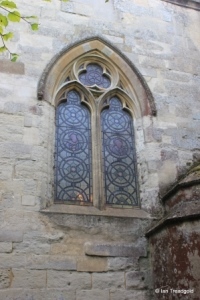 The three south facing windows are all modern two light trefoiled window with quatrefoil tracery under pointed arches with two to the east of the porch and one to the west. 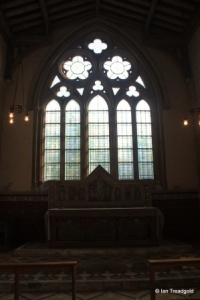 The clerestory above has four windows on each side, each of two trefoiled lights with quatrefoil tracery in the head. 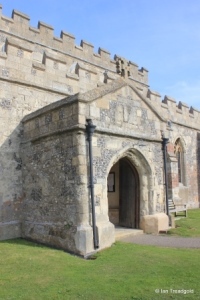 The south porch has no windows and the outer doorway is formed of a two centred arch, much weathered. 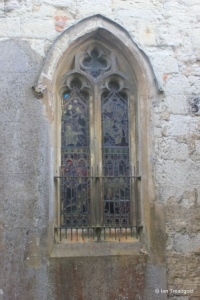 The porch has a flory design gable cross. 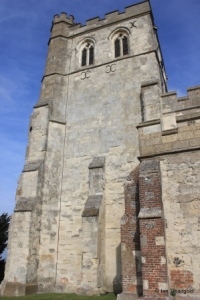 The tower is of two stages, a high lower stage with just the belfry level above. 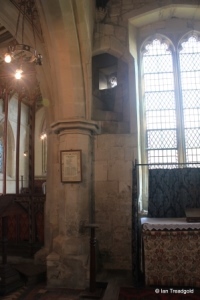 There is a stair turret in the south-west corner accessed from inside. 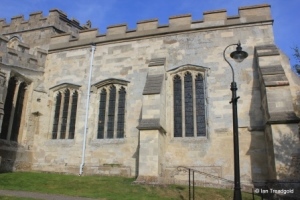 The tower was badly damaged in a fire in 1828 and restored subsequently with necessary extensive bracing ironworks in the walls. 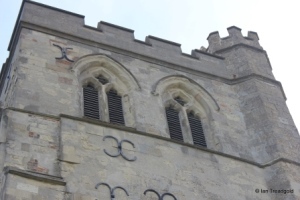 The belfry level has two three light trefoiled openings with quatrefoil tracery under pointed arches on each side. 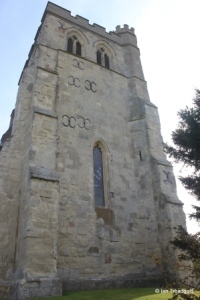 The sole clock face is on the east side of the tower. 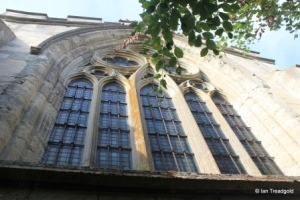 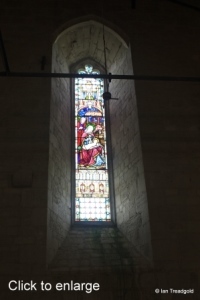 The west window is a single light cinquefoiled window under a pointed arch. 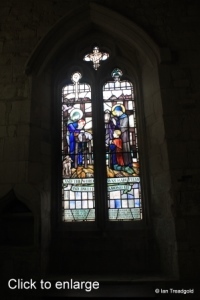 The stained glass shows the nativity scene. The north aisle is similar to the south with three windows to the north. 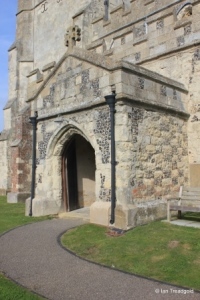 The two surrounding the north porch are similar to those on the south aisle. 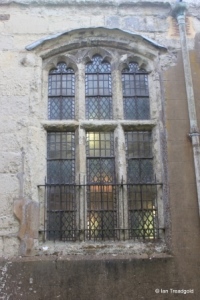 The easternmost window is of three trefoiled lights under a flat four-centred arch with a transom above half way up. 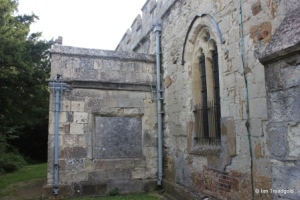 The north porch has windows to the east and west although that to the west is now boarded up. 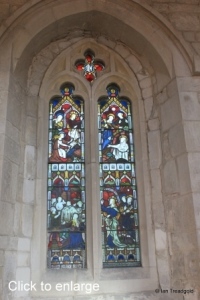 That to the east is of two joined pairs of two-light cinquefoiled windows under a common square head. 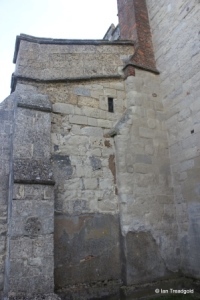 Interestingly there are signs that the westernmost bay of the north aisle formed some kind of two-storey lodging as there is a tiny low window and another high in the west wall of the north aisle. 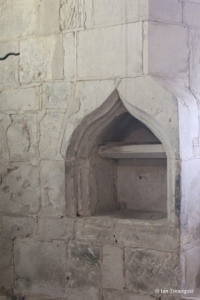 Inside there is what appears to be a first floor fireplace. 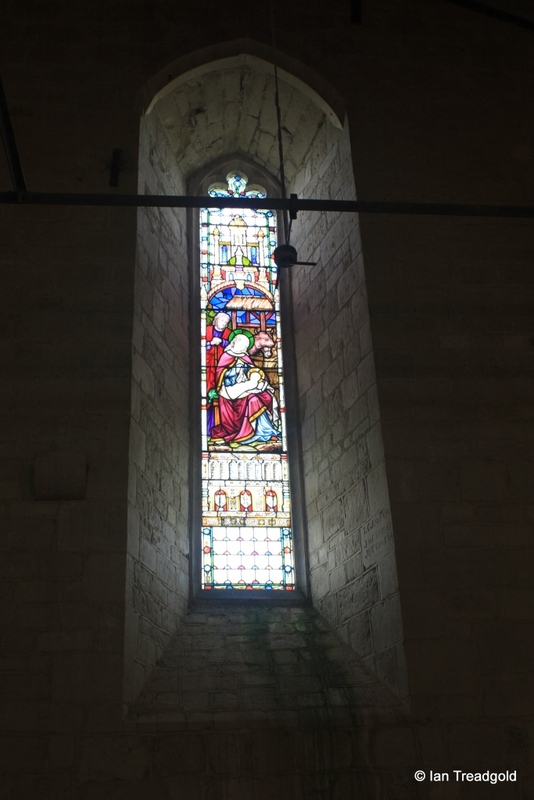 The north transept has an imposing north window of five cinque-foiled lights under a flat four-centred head. 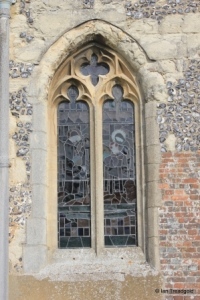 The north side of the chancel has a single modern two trefoiled light window with geometric trefoil tracery above under a pointed arch. 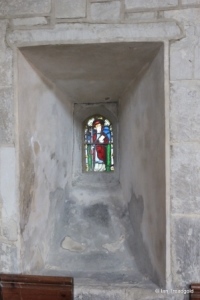 Between the chancel and the north transept is a passage way lit by a small circular quatrefoiled window. 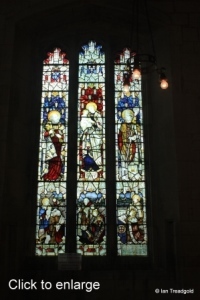 The east window is of five uncusped lights with an intricate geometric tracery design incorporating trefoil an quatrefoil designs all under a two centred arch. 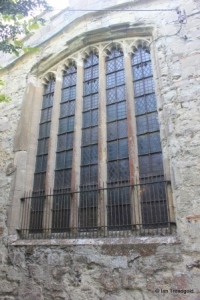 The south side of the chancel has three three-light cinquefoiled windows under flattened four-centre arches. 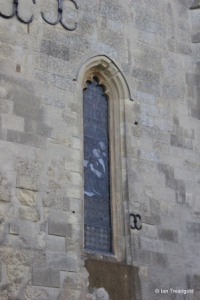 The eastern of the three is slightly taller than the other two. 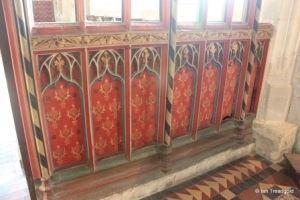 Inside the church, the chancel screen and misericords inside date from the C14 and C15 although the painting will be Victorian restoration. 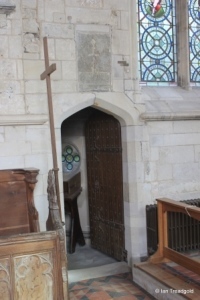 In times past the screen above between the nave and chancel must have had a gallery above as the entrances to the rood stair are clearly visible in the south chapel and on the south side of the nave. 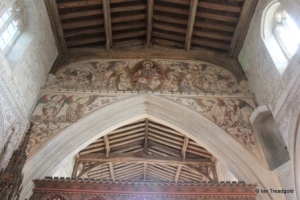 Victorian restorers have added much painting above the chancel arch and on the nave and clerestory walls. 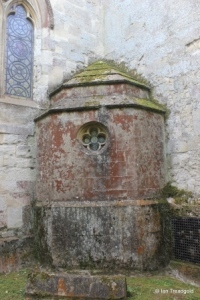 There is a piscina in the south chapel under an ogee arch. 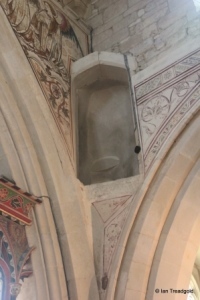 By the main altar, the piscina is under a cinquefoiled head under a shouldered arch. 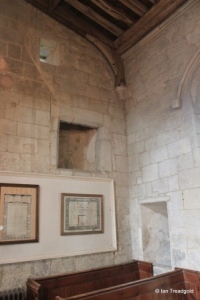 Next to it is the sedilia under a four-centred arch. 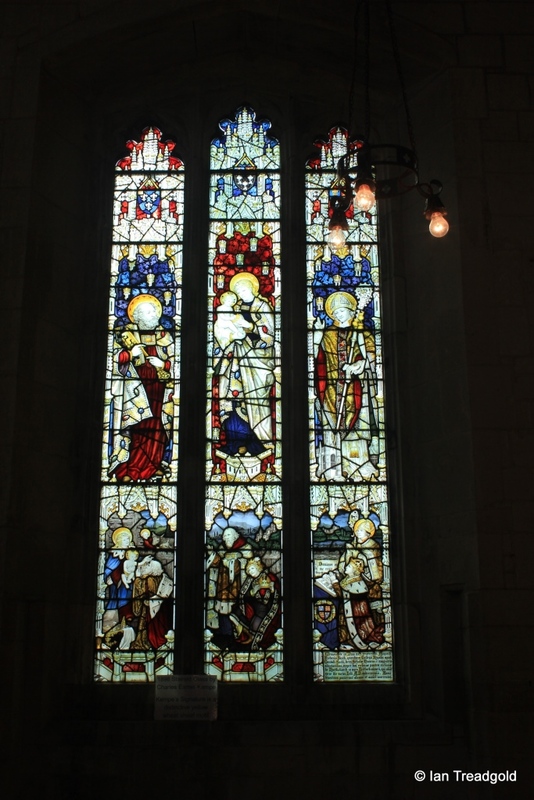 Page last changed 27/009/2014. 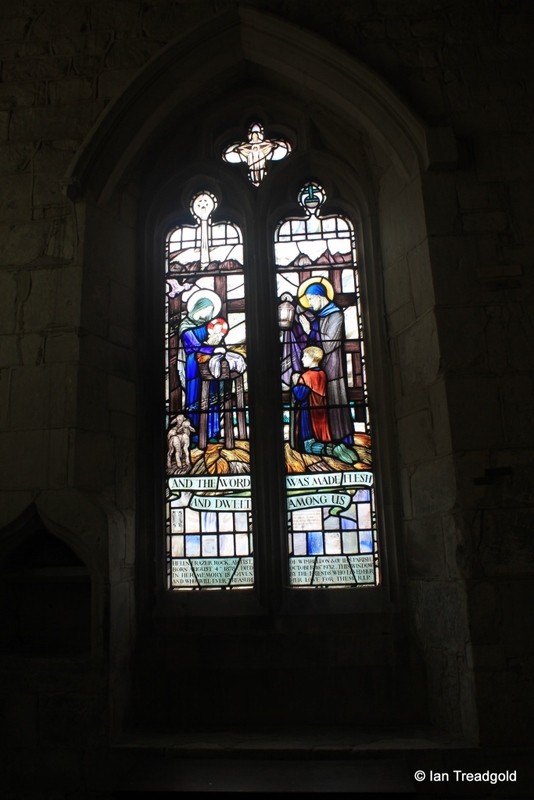 Reformatted 06/02/2016.